China, milk and the return of the urban dairy? One of the most remarkable features of agri-food globalization has been the transformation of dairying into a global foot-loose industry. Remarkable because milk is the archetypal perishable good: it can be preserved by converting it into cheese, or butter or yoghurt, but fresh milk spoils quickly and needs to consumed soon after production. As such, it was a principle of old-style agricultural geography that dairy farming happened in districts relatively close to urban areas, with actual dairies often located in towns and cities so that fresh bottled milk could be delivered to customers daily. Advances in preservation technologies disrupted this relationship, allowing fresh milk to be stored for longer and transported over longer distances. As proximity to the market decreased in significance as a locational factor, dairy farming has become a foot-loose industry, clustering in regions where production costs are most cost-effective. In Australia this process was accelerated by the deregulation of the domestic milk market in 2000, which removed production quotas previously awarded at a state level, leading to a slump in prices as the subsidies received by dairy farmers in New South Wales and Queensland were removed and the domestic market became dominated by cheaper milk from farmers in Victoria who were already working to world market prices. Ten years ago I visited a farming couple in the Kilcoy Range north of Brisbane whose family had been dairy farming on the property since 1902. After four years of struggling against falling prices they had just decided to sell their herd and pull out of dairying, and they were not alone. In 2000 there had been 26 dairy farms in the local area, the withdrawal of my interviewees left only four still operating by the end of 2004. The spatial restructuring of dairy farming has been repeated at an international scale, facilitated by the industrial production of powdered milk, which does not need to be refrigerated and can be easily transported in bulk. The largest exporter of powdered milk is New Zealand, whose 1,375,000 metric tons of exports account for nearly two-thirds of world exports of powdered milk. The majority of these exports are made by Fonterra, a farmer-owned cooperative created by the privatization of the New Zealand Dairy Board, which has become a key player in the global dairy market, with a complex web of subsidiary companies and trading relations across the world, as documented by Stuart Gray and Richard Le Heron in the New Zealand Geographer. Fonterra’s most important single market is the world’s largest importer of powdered milk, China, where consumption of milk jumped from practically nothing in the 1970s to over 7,000,000 metric tons by 2004 (as Andrea Wiley records in the American Anthropologist, there have also been massive increases in milk consumption in Brazil and India). The international trade in powdered milk sets the world market price for milk as received by the farmer, whether it is for export or domestic use. Back in August I listened to a Swedish farmer complain that even though his family firm owned an ice cream factory that used powdered milk as a raw ingredient, he still got paid less than the cost of production for the milk produced by his dairy herd – the reason being that the milk had to be sold to a third party for processing, and they paid the world market price. The world market price for powdered milk also affects the price of liquid fresh milk: if the price of powdered milk is low, supermarkets and dairies are better able to cut the price they pay to farmers for fresh milk, as the available alternatives to farmers are limited. Thus, in recent months, an increase in global supply of milk, the trade embargo on European and US sales to Russia, and rumours that China had been forward-buying milk supplies in 2013, all contributed to a fall in the world market price for milk that lead ultimately to cuts in the farmgate prices received by farmers in countries such as Britain to well beneath the cost of production, and provoked direct action protests by farmers in Britain, Ireland and France, including blockades of supermarket depots and dairies. Yet, despite market wobbles, demand for dairy in China is likely to continue drive up global milk production and exports, as well as milk production in China itself. China is now the world’s third largest milk producer and major transnational agrifood corporations including Danone, Arla, Fonterra and Nestle have invested in Chinese dairy companies and infrastructure. However, China still imports 14.3% of the milk that it consumes, much of it, as noted above, from New Zealand under a Free Trade Agreement signed in 2010 which I noted in a previous post the rural sociologist Hugh Campbell has described as more a food supply arrangement from New Zealand to China akin to the old imperial preference model than a genuine two-way free trade deal. Dairy also forms an important part of the new Free Trade Agreement between China and Australia, details of which have been announced around the fringes of the G20 and APEC summits over the last week. Under the agreement, Chinese tariffs on dairy imports from Australia will be phased out, bringing them into line with the conditions enjoyed by New Zealand. Nor is it just about milk powder. A series of contamination scares and scandals has hit Chinese consumer confidence in powdered milk (especially that produced in China) and generated demand for imported fresh milk, with Australia identified as a key supplier – but not necessarily Australian farmers. The desire to secure safe fresh milk supplies was behind the purchase of 50 dairy farms in western Victoria by a Chinese-led consortium last month, as well as Chinese investment in the Tasmanian dairy industry announced a few days ago. The Australian newspaper reported on Saturday that the latter deal will involve Tasmania increasing its milk production from 800 million litres a year to 2 billion litres. 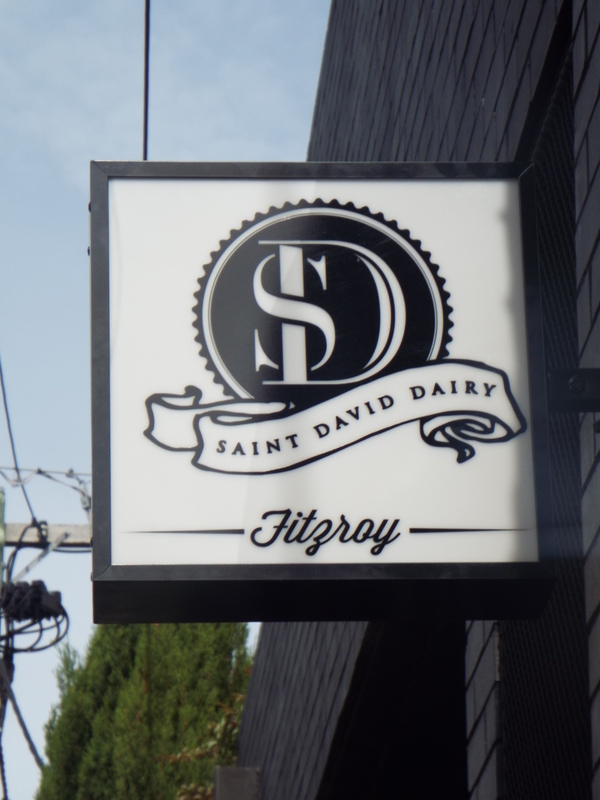 Against this backdrop of globalization in the dairy industry, I was consequently intrigued to come across the St David Dairy in an inner-city side street of Melbourne last week. A boutique micro-dairy supplying locally produced milk to local customers, the St David Dairy seems to be the antithesis of global corporate dairying, but it has sprung from the same dynamics of industry restructuring. Founder Ben Evans is fourth generation family dairy farmer from south west Victoria, and a trained food technician. Like an number of entrepreneurially-minded Australian farmers he traveled abroad for inspiration in adapting to the deregulated Australian agricultural economy, in his case visiting cheese-making regions in Europe and working on a dairy farm in Ireland. Unlike others (including several farmers who we studied for the globally engaged farmers project), this experience was not channeled into developing a niche product for export, but to a decision to set up a small dairy supplying premium local fresh milk to the fashionable coffee shops and delis of the gentrified Fitzroy neighbourhood. The micro-dairy now processes 10,000 litres of milk a week with custom-made equipment that is smaller than that used in mainstream dairies, and with pasteurization limited to the legal minimum to retain a close-to-raw fresh taste. The milk is collected three times a week from selected farms all located within an hour of the dairy, process and bottled the same morning, and delivered that afternoon to customers, who now include 22 cafes, restaurants and shops in Fitzroy, and a further 92 spread across the city. St David Dairy is not just re-localizing milk supply, but is also re-urbanizing dairying. As Evans has pointed out in articles about the business, in 1920 there were 27 dairies in Fitzroy, but by the 1960s that had all closed. The local food movement is the other side of the coin to agri-food globalization, with distrust of mass-produced food and transnational corporations and solidarity with local farmers reviving interest in eating local produce – as has been well documented and debated in the rural geography and rural sociology literature. Dairy products such as cheese, yoghurt and ice cream are staples of farmers markets and farm shops, but until now fresh milk has not featured prominently. This omission is starting to change, with micro-dairies being established in several parts of rural England, for example, by farmers opting out of contracts with supermarkets and agribusiness and into supplying local customers directly, but it will be interesting to see whether the St David Dairy’s return to the city is replicated by a new wave of urban micro-dairies in London, or New York, or Toronto, or other cities? In global market terms they will remain miniscule in comparison with the rush to provide milk to China in industrial qualities, but for a few dairying will have come full circle.